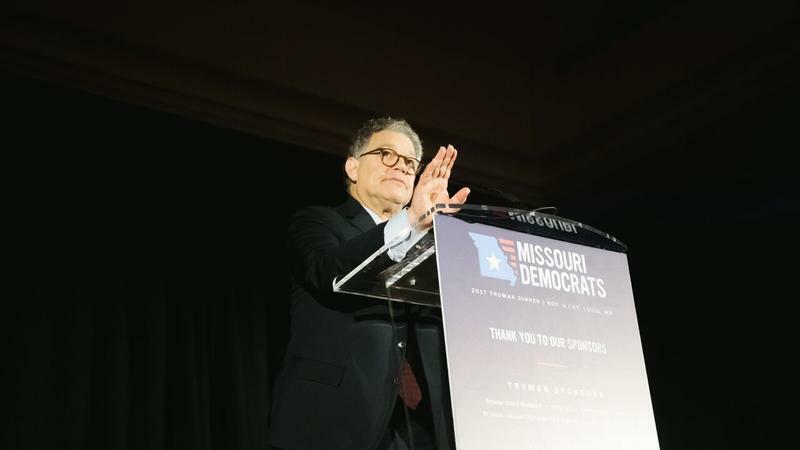 U.S. Sen. Al Franken speaks Saturday at the Truman Dinner in St. Louis. The Minnesota senator was the keynote speaker for the Missouri Democratic Party event. He exhorted Missouri Democrats to spend the next year on the phone and on the road, and ignore their families. “Ignore them. They’ll be fine,” he quipped. The crowd’s laughter didn’t drown out his serious purpose for being in Missouri. Franken had spent much of Saturday barnstorming the state (he joked he could vouch for a new Kansas City airport) to raise money for fellow Sen. Claire McCaskill, a Missouri Democrat who is considered among the most vulnerable Senate incumbents. Franken highlighted her fight against wasteful government spending, which he said mirrored the fiscal battle that then-Sen. Harry S. Truman had waged during much of World War II. Neither Franken nor McCaskill mentioned her possible GOP rivals. Instead, they focused on the Democratic economic message. “We believe in a country where there is opportunity for everyone, not just at the top," Franken said, after relating a sobering story about his mother-in-law, who became a widow at age 29 with five young children. Social Security survivor benefits and government education loans kept the family out of abject poverty, he said, and allowed the widow and all four daughters to get a college education that led to better jobs. McCaskill and state Auditor Nicole Galloway are Missouri’s only statewide Democrats — a major reason why they are prime Republican targets next year. Thanks in part to Donald Trump’s presidential surge, the GOP swept all the statewide offices on the 2016 ballot. At the Truman Dinner, it was Galloway who delivered the toughest political attacks, along with state Democratic Party chairman Stephen Webber, a former state legislator from Columbia. Galloway, who is also from Boone County, said the GOP is targeting her because she is independent. She pointed to 13 public officials across the state who’ve been charged with financial crimes since she took office. Despite Gov. Eric Greitens’ promise to improve ethics, Galloway contended that “the ethical environment in Jefferson City is worse than it was a year ago,’’ particularly because of the rise in outside political groups who don’t have to report their donors and are influencing public policy. Greitens has ties to at least one of them. Webber offered a similar theme, and zeroed in on his party’s “sense of urgency” to change what’s happening in the state Capitol. “Our state is being bought by a small group of billionaires, who are concerned only with what is good for themselves,” Webber said. Webber cited the passage of a “right to work’’ law to curb union rights, overturning St. Louis’ higher minimum wage, and healthcare cuts that he said are forcing almost 40,000 elderly to pay more for their prescription drugs as of July 1. This article first appeared in the St. Louis Beacon: August 25, 2008 - As Democrats opened their presidential nominating convention in Denver, the message seemed to be one of introduction, of making sure that all who watched knew that Barack Obama was brought up by a single mother who worked hard.